Below you’ll find our reading selections for the year of 1966, and at the end of our reading, you’ll find my thoughts on the year and our winners for hero and villain of the year. Halfway through the 1960’s, we’ve seen the Fantastic Four and Spider-Man trade Hero of the Year titles in an impossibly competitive series of votes. Nonetheless, nothing to date has been as excruciatingly, hair-pullingly, how-do-i-even-decide-this-sanely close as the duo’s 1966. In fairness to the other heroes in Marvel’s roster, there are a lot of worthy votes for stories like Iron Man’s battle with The Titanium Man, Cap’s battle against a Red Skull wielding Cosmic Cube, and Black Panther single-handedly taking down the Fantastic Four (for kicks no less!). That said, the consistency across Spider-Man and Fantastic Four throughout 1966 is hard to really do justice. The highlights go on to define each title’s legacy, from Spider-Man’s heroism and relationship with Norman Osborn, to the Coming of Galactus. Inarguably, the Fantastic Four’s year does more for the Marvel Universe as a whole. Jolly Jack Kirby and Stanly the Manly dreamed up the Inhumans, Black Panther and Silver Surfer within the span of 7 issues (not to mention Galactus and Wyatt Wingfoot). It doesn’t take much more than a cursory glance at the upcoming MCU calendar to realize that the Fantastic Four’s adventures were so imaginative they synthesized universes of their own. Even while the Fantastic Four soared through big picture EVENTS, and saved the entire Earth all at once, Stan and Jack still found time for Fantastic Four #51. “This Man, This Monster” is a perfectly executed glimpse into Ben and Reed’s relationship and heroism. I can never rememer if we even hear the name of our “villain,” but that’s entirely the point. This isn’t necessarily my favorite Ben Grimm story (how could it be when most of The Thing’s actions are from a fake! ), but it’s an all-time great. Spider-Man continues to operate on an appropriately smaller scale, albeit with more complicated personal stakes. Steve Ditko would be done with the web-slinger after Amazing Spider-Man #38, but that still gave him time to plot and draw “If This Be My Destiny” in issues #31 to #33. Amazing Spider-Man #31 to #33 are simply some of the best Spidey comics you will ever read, and never cease to inspire me. It’s safe to say that Peter Parker’s stubborn courage throughout these three issues is the reason he’s my favorite Marvel superhero of all time. Honestly, AMS #31 to #33 would be enough to make me consider Spidey a contender vs. The Fantastic Four, but it’s Amazing Spider-Man #39 to #40 that seal the deal. John Romita took over for Steve Ditko on art, and not only did he not miss a beat, but he came out of the gates with the first definitive Green Goblin story! For all intents and purposes, these two issues are the backbone of Sam Raimi’s first Spider-Man movie, and capture and stolen secret identity of Peter Parker make for tense, riveting comics. The scenes of Peter fighting the Green Goblin in plain street clothes outside his home with Aunt May are some of my favorite panels of the year. So, where did the votes net out? Do we award the Fantastic Four for size and staying power of their adventures, or does 1966 go to Spider-Man for a third title? Spider-Man won the vote by a narrow 3%, and although I’m glad I don’t have to deal out a tie-breaker here, Spider-Man gets my vote as well. I Hunger… For A Look Prince Would Envy! Villain of the Year proved to be a much easier decision yet again, and let’s face it, there’s only one contender on this list who EATS PLANETS. That’s right, Galactus is our Villain of the Year. Apparently his mid-Earth snack costume change (from green to purple armor!) did nothing to dissuade the mighty marvelous year voters! As memory serves, Galactus is the first Fantastic Four villain that the FF can’t truly beat. Sure the Thing has a hard time clobberin’ the Hulk, and Doctor Doom always gives the team a heart attack, but there’s no fighting or outsmarting their way vs. Galactus, at least under conventional measures. The use of the Ultimate Nullifier has always been a curious plot turn from Fantastic Four #50. Reed Richards would rather wipe out all of existence than see Galactus eat Earth? It’s selfish, sure, but it’s also how I’d have to think most human beings would approach a scenario. It’s a stark contrast to Richard’s later understanding of the World-Eater as well. I’ll always wonder… what if Galactus had called Uatu and Reed’s bluff? Would they have done it? Fortunately, we never have to find out, leaving us to crown Galactus with his first Villain of the Year title. I’ll always remember and be inspired by the opening pages of AMS #33. What never ceases to amaze me is that after that herculean effort, Spider-Man still has to get out of the underwater base and fight the Master Planner’s remaining henchmen! I can barely perform a second task after I shovel snow, and here Spider-Man is taking on an army after lifting the whole base on his back! The Coming of Galactus received several votes for issue of the year as well, but it’s Amazing Spider-Man #33 that takes home a 50% majority. Wasn’t there a fan, somewhat of a BNF, who was known as the guy who ‘collected 1966’? I too view 1966 as a very pivotal year in my life, as its the year where my nascent interest in comic books soared suddenly that Spring when I went to the Burlingame Smoke Shop and saw, beneath a large candy bar rack at knee-high level (and two spinracks down at the end of these wooden floorracks) literally almost any comic you could imagine…THUNDER Agents 3, Amazing Spider-man 37, FF 53, Tales of Suspense 81, and so many more! It started a personal mania of mine that lasted through the 90s, and while I no longer have all those comics from the 60s (I have about 8 short boxes of 60s, 70s comics left), I still love comics, but alas…much less so the stuff put out by Marvel or DC. Just…doesn’t ring for me anymore… thanks for this website! I think you misinterpreted Reed being willing to erase the universe. Uatu tells him on page 7 (wasn’t it convenient how they numbered the pages back then?) not to turn up the power all the way and there’s no indication that Reed didn’t comply. 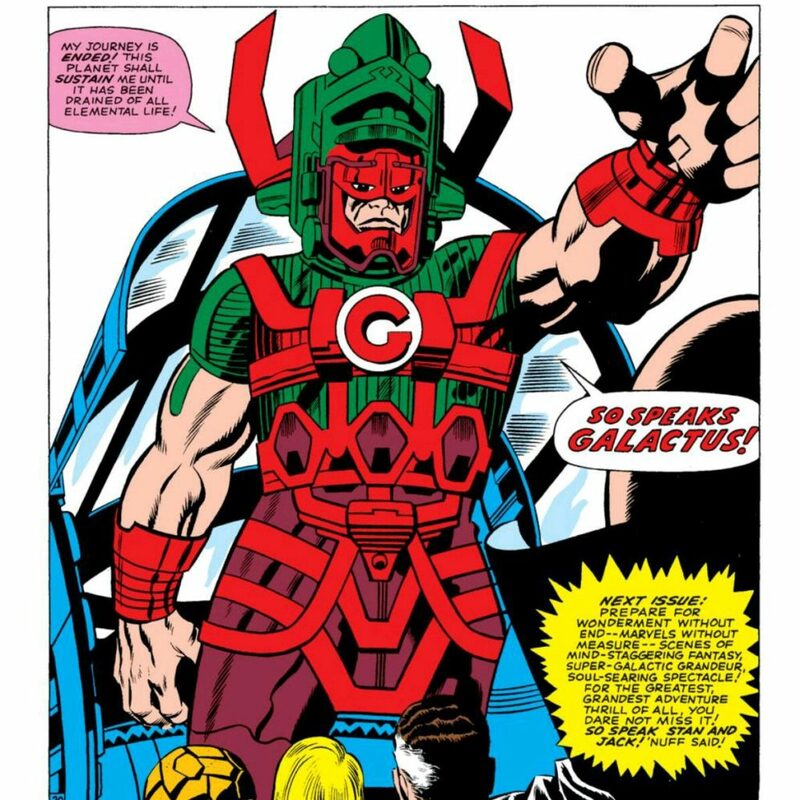 Richards and Watcher may have been bluffing but I’d have thought that Galactus would have been able to tell what the Nullifier was set at. It was, after all, from his home planet. Avengers #25, 29: Yeah, sorry. Still can’t warm up to Heck’s art. Thor #131-133: Speaking of non-warming, I like the King’s art just fine (I may have already mentioned that), but Colletta really mutes it. I really love Stan’s words here, though – especially the Inspectors’. They had me literally cracking up! Even though I was never really able to suspend disbelief enough to appreciate Ego, that last panel of #132 (main story) is AWESOME! These don’t change my votes, however. Enjoy your supper, Chicago. Wow! What a year! The only “low points” for me were Daredevil (sadly), and the Iron Man stories (I’m just not a big fan of his). I really am struggling to pick favorites. The first Spider-Man arc was beautifully paced, intriguing and satisfying. Maybe the best Spider-Man story yet! The Fantastic Four, for me, was just one great hit after another, but I have to say, that #51 was wonderful. Gorgeous art – Page 1 w/the Thing standing in the rain and Page 14, a full page of Reed entering the intersection of eternities, or what have you, particularly stood out to me. Also, can I just mention how much I love reading the fan letters at the end, and that they published their addresses! The Avengers issues were okay. I really like Hawkeye, but overall they’re not doing much for me. The Black Widow with black hair is different…that is all. The Dr. Strange issue was easy to look at. The battle of Dormammu vs. Eternity was wonderfully rendered. I have to keep telling myself that this stuff was done in 1966! To be honest, I wasn’t looking forward to reading Thor. I feel like their wonderful stories to be read involving him, I just don’t think they’ve happened as of 1966; but, I wanted to get to that Ego the Planet issue, what with the rumor that he may be appearing in GOTG 2 next year. Man, was I not disappointed! The creativity, artistically, was breathtaking. I soaked up that full page spread when we first meet Ego. Just. Absolute. Greatness. Villain of the Year: Tie between Ego and Galactus, with an honorable mention for Foggy Nelson pretending to be Daredevil and endangering himself and Karen Page. Issue of the Year: Triple Tie (Is that a thing? If not, I declare it as such!). AMS #33, FF #51, Thor #133. Aside #2: I mean, what is the deal with Stan and love triangles?! Tony/Happy/Pepper; Matt/Foggy/Karen; Thing/Silver Surfer/Alicia Masters; Peter/Ned/Betty; Cyclops/Beast/Marvel Girl; Doom/Doom/Anything that resembles Doom. A trope as old as time, I guess. Truly an outstanding year, with that run of FF issues (Inhumans, Galactus, Silver Surfer, and Black Panther/Klaw) being practically unbeatable. I’ve read the Galactus issues probably five times now, and they never cease to be incredible. Kirby’s artwork in particular is astounding all year; I actually gasped at the first appearance of Ego The Living Planet due to how beautiful and otherworldly it was, but also, the imagination in Wakanda. Spider-Man also had a terrific year, with some excellent villains and the eventual unveiling of super groovy Mary Jane actually paying off after years of build-up. And yes, Cap and Red Skull having a Cosmic Cube battle is about as Marvel as it gets. Spidey #31-33: Great little tale! (Or maybe not so little.) Didn’t realize radiation was still so prevalent…but I guess it had to be to see the story through and it fits with Doc Ock’s bio. FF: #46,47 – Poor Johnny. I can relate…prolly at pretty much the same age. #48-50 – It’s strange that the Surfer feels all these new…well, feelings. I woulda thought that he would have experienced them as Norrin Radd. Hindsight being 20/20 n stuf. #51 – Eh, not one of the best. Still, the Kirby/Sinnott art is gorgeous. #52,53 – Hmm. #52 seems a bit forced. Who didn’t know – even back in ’66 – that the FF were the ones to be hunted? Also the intro to Klaw, who IMHO will become more interesting, as will the Panther. Suspense #78: I love me some Colan art! Paired up with Kirby…how can ya go wrong? Well, maybe with Ultimo. It’s too bad that Mandarin needed an android to go up against IM. Astonish #76: Ah! Lord Vashti’s origin…somewhat. Not that familiar with Adam Austin, but never cared for Vince Colleta’s artwork. Don’t much care for the Hulk’s artwork either – but don’t tell him that. So, is this the first appearence of the Executioner? I thought he was Asgardian. Might have to read an issue or two more to find out. DD #18: Poor Foggy. When will we learn? Just. Be. Yourself. But I guess that would make for a more boring comic. Strange #146: Big Kirby fan! Donnie Heck…not so much. Strange combo. But good to see the continuation of the ToS CA story. I coulda gone crazy not knowing it was here. Some of (I feel) Ditko’s best…or at least, most interesting…work is here. Sadly the story, if not the script, seems rather…light? Guess that’s the word. Suspense #79-81: Kinda bad seque between #78 and 79 for Cap. And Them? Sounds like an old SF movie. So bad it was good! But first, somebody kindly explain why androids need to breathe? Spidey #39-40: And Spidey’s, too! Not to mention the debut of Romita! I have to laugh at the title, though – “The End of the Green Goblin”. Hindsight’s 20/20, eh? Oh, and FF get my vote for Heroes of the Year and FF #48 gets my vote for Issue of the Year. #48 starts and #49 and 50 continue with ushering the Marvel Cosmic…uh, era? The Red Skull gets my vote for Villain of the Year for messing with something like the Cosmic Cube (no relation). Amazing Spider-Man 31: The first appearance of Gwen and Harry is rather odd. But that’s only a minor distraction given the real stress that comes from Aunt May being sick and Peter trying to keep at it as Spider-Man. Mostly this is just the foundation issue to propel into the next two. Good issue. Amazing Spider-Man 32: The guilt of giving radiation poisoning to May really came off the page. And the whole ticking clock plot with the ISO-36 provided good stakes to the whole Master Planner/Doc Ock plot. As for the Betty/Peter/Ned stuff…I just want that to be over at this point. The cliffhanger here is incredibly stressful. Amazing Spider-Man 33: This is a great issue. I felt tired just reading Peter struggle his way through the henchmen and get back to May. I hate Jameson here…stop being such a jerk to everyone. I love everything about this, and I’d say this is a strong contender for best issue of the year. Fantastic Four 46-47: I’m not really feeling this Inhumans stuff, but this seems to be a minority opinion compared to other commenters. The backstory was interesting though. Fantastic Four 48: I like this much more. The conclusion of the Inhumans plot does work, mostly on the strength of Johnny and Crystal’s separation. The Silver Surfer should be goofy, but he really works…this may be helped because I’ve been reading the current Surfer Run. I like the Watcher getting involved again, and I’m incredibly amused by his efforts freaking out all of the normal people. Galactus looks ridiculous, but that’s fine, the Watcher being so freaked out builds up the dread. Fantastic Four 49: Galactus’ coloring makes him more intimidating in this issue. I really dig the whole semi-Lovecraftian uncaring comics being thing that’s going on. The Surfer turning on his master is a rather amusing turn of events, and the Watcher’s over the top reaction made me laugh. Fantastic Four 50: The resolution of the plotline is pretty neat with The Watcher, once again, stepping way outside his stated bounds. I like the commitment to a hopeless fight to make a stand for the planet. I also really like how the plot just moves on in the second half of the issue, and am bemused by the deep denial held by the normal people. It doesn’t hurt the issue at all, but I thought Johnny was older than Peter…has he intentionally started college later? This might be my favorite of the Fantastic Four issues so far, so that automatically puts it in the running for best of the year. Fantastic Four 51: This is an interesting, but kind of odd issue. The villain coming out of nowhere as well as Reed and Sue’s reaction to Ben Grimm kind of through me for a bit. I honestly though Reed was testing the Fake Thing, but nope. Still, this was a very good exploration of Ben’s place in the Fantastic Four. Fantastic Four 52-53: Some of this was a little cringe-inducing, but I was surprised how respectful, by 1960’s standards, the Wakandans were being depicted. Our heroes were iffy though. I also had trouble taking Klaw, Master of Sound very seriously. But, overall the Blank Panther makes a strong first impression and I enjoyed these issues. Avengers 25: Walking into the country known to be ruled by Doctor Doom isn’t the wisest move our heroes have ever made. Overall the battle between them and Doom was an enjoyable romp. The whole time traveling Doom/Kang thing is still confusing. Tales to Astonish 76: Uh…this issue was…hmmm. Well, I hadn’t realized I missed Namor so much until I saw him again. Same with Hulk. The Namor story was fine, if boring, and the Hulk story was just odd. I don’t really know what to say about this. Daredevil 18: OK? This was really stupid. Not nearly as stupid as Stilt Man, but…eesh. I feel like Daredevil right now actually has all of the negative stereotypes associated with the Silver Age. This is just nonsense. Strange Tales 146: I feel a little bad for Dr. Strange. No matter how great a story he has, he’ll always struggle to make it to the top of the year if the front story doesn’t hold up. The SHIELD story was weird at best, boring at worst. Just not great. The Strange story on the other hand was excellent and the art that went with the epic showdown was fantastic. Tales of Suspense 78: Another instance of the viallain defeating himself, which is silly, but I actually really liked Tony having his assets frozen because he thumbed his nose at the government. I was hoping the Captain America/Nick Fury story would be more interesting than it was. I’d rather an issue of them just swapping war stories. Tales of Suspense 79: Stark’s continued difficulties with the government are Issue of the year worthy, but Namor’s supporting cast are just not as interesting as he is so I felt they were butting into a story I was enjoying. The Captain America story was entertaining enough, but just doesn’t hold up it’s end of the issue. Tales of Suspense 80: I accidentally read the next Iron Man issue before this after not hitting the Read Online button, so I had some of the points spoiled for me which is annoying. Namor was fine here, but this whole thing seems more random than usual. The Captain American conflict was much better than the previous effort, ending on a well executed cliffhanger. Tales of Suspense 81: Tony is finally humbled, and decides to report to the government and it’s really interesting. I did laugh at that guy at the airport who wondered what flight Iron Man would be on. Dude, he’s flying right now. The Captain America issue was incredibly epic and Cap proved to be both unyielding and a bit clever. If not for all of the Spider-Man issues this might be a contender for best of the year. Avengers 29: I should feel worse about Hank, but the dude just needs to pick an identity and stick to it. I was glad to see Black Widow again, so that’s good. Amazing Spider-Man 40: Oh villainous monologuing, will I ever tire of you? I kind of wish that Peter had been able to free himself instead of being released, but that’s a very tropey thing to happen. And Norman’s relationship with Harry is just really well told. Not quite as strong as the last issue, amnesia lol, but it’s very good. Thor 131: I was originally rather incredulous about this alien so happening to be Jane’s roommate, but I got sucked into the story anyway. I like this sly strategizing from Thor basically allowing himself to remain captured until he learned more. I wonder if Tana Nile was motivated by Galactus’ failure to begin her efforts? The Tale of Asgard was fine. Thor 132: Vaguely complicated factions within the alien race and a possible external threat? Fun! I enjoyed how incredulous that cop was about the alien invader, given everything that happens all the time in Marvel Universe. The level of denial seen in the public sometimes is Sunnyvale levels. Also, what’s up with the very odd head of the person sitting next to Jane? Oh, and I’ve really come to love when they do those weird full page artistic renderings of alien entities. Thor 133: Ah, the weird headed thing is intentional and ongoing, I’d probably know more if I was reading every issue…I suppose I should assume it has something to do with the invasion plot. Now, while I was once again whatever about the Asgard story, the main story here was fantastic. Gorgeous visuals, weird plot, cool ideas. Great, great, great. Might be my second favorite issue of the year. The form for voting seems to be unavailable right now, can that get fixed soon? I’ll be extremely surprised if Spidey doesn’t take out hero of the year, it’s been a stellar year for all the books but all his issues hit it right out of the park. Now, this is what I am talking about: 1966. Could very well be Marvels Greatest Year. It is certainly the high water mark for Stan, Jack and Steve. I admit I had been struggling through the some of the books in the earlier years, but this will be a breeze…probably just because I’ve read so many of these so many times. These are some of the key stories that got me into comics. Back in the halcyon days of my youth there was no internet and reprints were the only way to get to read these chestnuts. I had Marvel Treasury Editions, those huge over sized books, which reprinted the Fantastic Four’s first encounter with Galactus and some 1966ish Dr. Strange stories. Then there were the Marvel Tales, with reprints of Spidey in “If this be my destiny” (still have those); Marvel Triple Action that reprinted the Avengers (my grade school buddy collected those); and Marvels Greatest Comics that reprinted the FF. The best were the Pocket Books Marvel Comics Series that reprinted Amazing Spider Man, the Captain America from Tales of Suspense and Hulk from Tales to Astonish (still have some of those, too). The only ones I am not all that familiar with are the Thor issues. Looking forward to finally getting into those classic Lee/Kirby Thors. On a side note, I’m surprised you picked Tales to Astonish 76, especially since starting with 85 is one of the greatest Hulk runs of all time. 1966 was a mixture of terrific comic ideas that elevate the wordy narration/dialogue and grid-based, mostly average art to the level of readable issues. I love the FF concepts of Attilan, Galactus, and Black Panther, but the issues themselves are such products of their time. Thankfully, all of these ideas will be done better later on. Certain classics do rise above the rest, though. Amazing Spider-Man #33 is still a great issue highlighted by the heroic struggle of Spider-Man to free himself to save his aunt. Surprisingly, Tales of Suspense is the best title of the year. The Iron Man/Titanium Man story from #81-86 is excellent, and the good vs. evil battle of Red Skull and Captain America in #81 is one for the ages. I want to give an honorable mention to the Super-Adaptoid arc from #82-84. My picks for the year? What is the approach going to be for story arcs that cross years? Will it be the year that it starts, the year it ends, the year that most of the arc is in, or a case by case approach? So far, I’ve been weighting it based on where the majority of issues occur. So for AMS #31 to #33, it starts in Dec ’65, and then two thirds are in Jan/Feb ’66. So that one’s easy. It’s going to get increasingly tricky, but that’s working for me to date.